Melt butter in a skillet. Add onions, carrots, and celery and saute for about 4-5 minutes or until veggies are just soft. 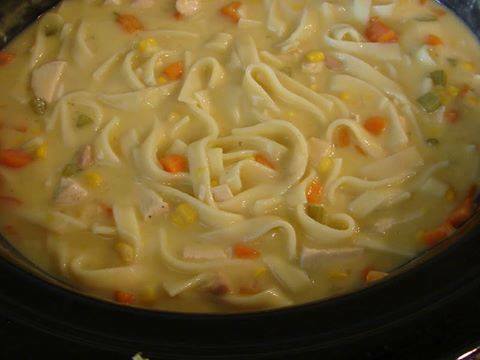 In a slow cooker combine chicken stock, cream of chicken soups, and evaporated milk. Whisk. Add cooked chicken, sauteed vegetables, and corn. Cook on low for 3 1/2 to 4 hours. Add noodles, cover, and turn slower cooker to high. Cook on high for 1 more hour. Serve with bread or crackers.